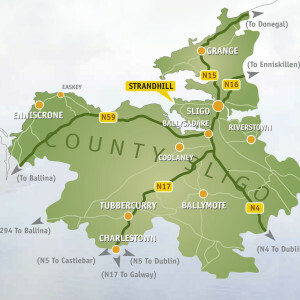 Sligo is located in the northwest of Ireland, about forty miles from Enniskillen and the border with Northern Ireland, and 135 miles from Dublin. Once a major port city located at the mouth of the Garavogue River, the name Sligo means “Shelly River” in Gaelic. The city is the 12th largest city in Ireland and the 2nd largest in the West (behind only Galway) with a population of about 20,000. It is also home seat of County Sligo, which has a population of 58,200. Nestled between majestic Benbulben mountain to the north, ancient Knocknarea mountain and the Atlantic Ocean to the west, beautiful Lough Gill to the east, and the rugged Ox Mountains to the south, Sligo is one of the most picturesque places in all of Ireland. It’s rugged landscapes rival those of tourist destinations like Killarney and Wicklow, but have gone largely un-noticed and therefore, provide the beauty without the crowds! Socialise in friendly local pubs and restaurants. The cannon at the sea front is a landmark since the early 1900s, when visitors flocked to the seaside during the summer season. Today, Strandhill is a good place to stay at any time, offering the best of food and entertainment throughout the year. Surf some of the best breakers in the world. The world surfing championships have been held here. Co. Sligo Surf Club operates from the Maritime Centre. You can even check the status of the surf online! Golf on Strandhill’s eighteen-hole links. Play a casual round with friends, or compete with other golfers to bring the silverware home. Trek to the top of Kkocknarea. The mystic mountain of Yeats’ poetry affords a breathtaking view across seven counties.